Hardcover - 160 pages - Affectionately known as the 'Stringbag' by its crews, the Fairey Swordfish biplane torpedo bomber was obsolete by 1939, but it still achieved some spectacular successes during the Second World War, including the famous crippling of the German battleship Bismarck in 1941. 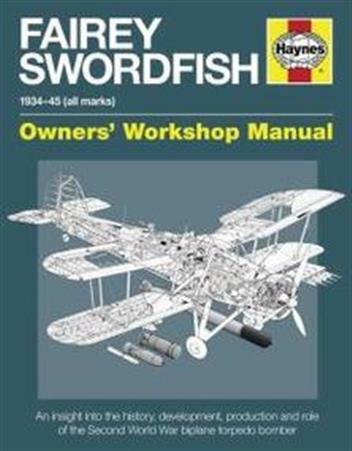 The centrepiece of this manual is Swordfish Mk II, LS326, operated by the Royal Navy Historic Flight from RNAS Yeovilton. The author and Haynes have been given unique access to this rare aircraft, which is one of only two airworthy examples in the world. Jim Humberstone followed a career as a conservation architect and historian. He is an explainer at the Fleet Air Arm Museum and a volunteer on the Royal Navy Historic Flight. He lives in Dorset.